A new Ethiopian spot has opened its doors in the neighborhood. The new addition to Greenway/Upper Kirby, called Blue Nile, is located at 3030 Audley St. 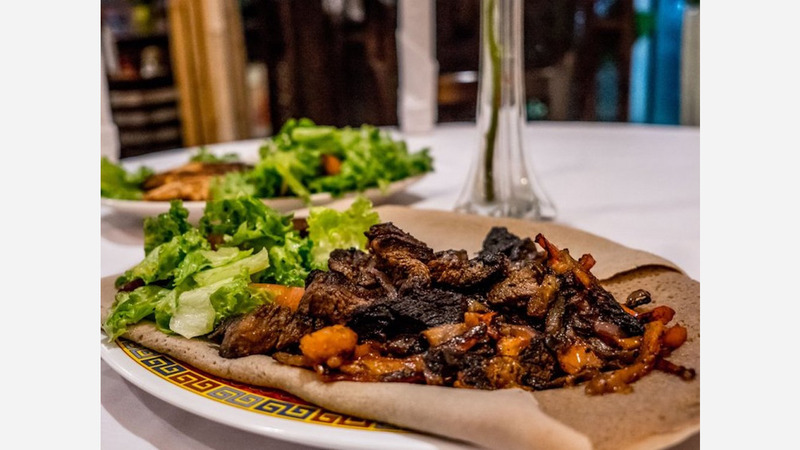 This new spot--which has another Houston location at 9400 Richmond Ave.--specializes in traditional Ethiopian fare served with injera bread made from 100 percent teff. On the menu, expect to see vegetarian dishes like yemissir wot red lentil stew simmered in berbere sauce, spices, garlic, ginger and green peppers; kik alicha split peas cooked with oil, onion and flavored with spices; and timatim fitfit fresh tomato, olive oil, jalapeno, and bell pepper mixed with injera pieces. Switching over to meat and fish entrees, look for dulet minced lamb tripe, lamb liver and lean top round beef sauteed with spiced butter and mitmita; chicken breast cubes in gravy sauteed with onions, herbs and spices; and deep-fried croaker fish served with rice and salad. Blue Nile has just two reviews on Yelp, which give it a five-star rating thus far. Ibrahim H., who was the first Yelper to review the new spot on January 6th, said: "The food is absolutely authentic and delicious. The aroma of the Ethiopian coffee is powerful and satisfying. Highly recommend this! Would recommend the samosas and the chicken platter." Blue Nile is now open at 3030 Audley St., so stop in to try it for yourself.